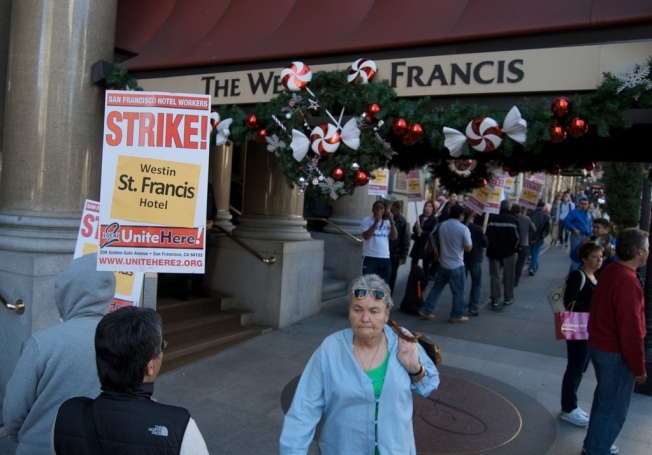 Workers strike out the Westin St. Francis in San Francisco. Steve Rhodes on Flickr. Strikers have forced the closure of one of San Francisco's finest restaurants. What will all the fancy people do? More than 600 Westin St. Francis workers walked off the job Wednesday morning. Shut down in the protest to get new contracts for city hotel workers was one of the Bay Area's finer dining establishments: Michael Mina. The restaurant will stay closed until Saturday evening, when the strike is scheduled to end. Some of the celebrity chef's unionized staff joined the protest, which has caused the closure. But workers at Mina's Clock Bar, across the hotel lobby, did not join the strike so it remains open. In a June interview with SF Eater, Mina talked about the benefits and pit falls of employing a union staff. "We are in a union environment, which is different from most other upscale restaurants; we're probably the only one in the City," he said. "There are many positive aspects to that, but the cost of doing business for us is very high." Mina co owns 17 restaurants with tennis great and former North Bay resident Andre Agassi. The chef has three Michelin stars.